Father and daughter present €2,000 cheque for cancer patient comfort at UHG. Ms Ciara Ni Fhatharta and her father Colm O Fatharta from Inis Meain recently presented a €2,000 cheque for the Oncology Patient Comfort Fund at University Hospital Galway. 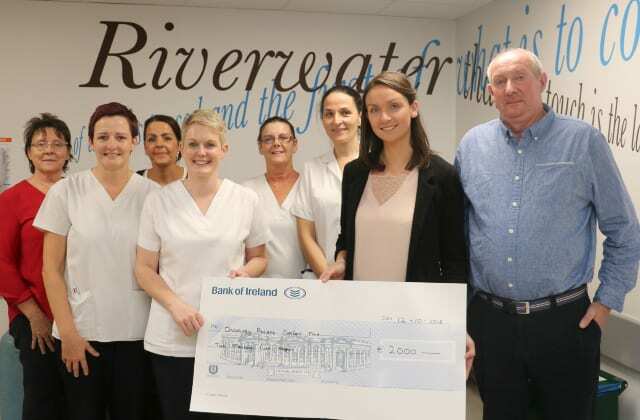 The two decided to make a donation in memory of their loved one Finuala Lynch Faherty, a retired public health nurse who had been a patient on the hospital’s Corrib Ward. Finuala Faherty passed away peacefully at University Hospital Galway last June. She is survived by her husband and daughter who presented this donation, and her son Diarmuid. They raised the money through donations made by family and friends at the time of her funeral. The family asked that the money be used to buy reclining chairs for patients and their family on the ward. They’d make a comfortable alternative for patients who want to get out of bed, and give family members more of a place to sit when they’re visiting. Ellen Wiseman, Assistant Director of Nursing for Cancer Services at UHG, expressed her gratitude to the Faherty family. Cancer Care West recently provided funding to outfit a new family room on the Corrib Ward to help families stay beside patients during their time in hospital.